This is an In Person Signed Black and White 10" x 8" Photo of the former American Boxing Champion. 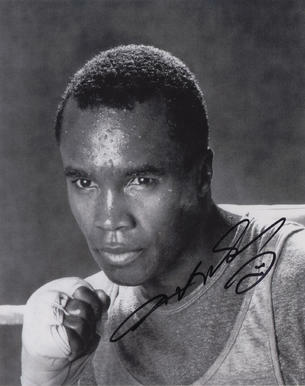 Sugar Ray Leonard (born May 17, 1956) is an American retired professional boxer and occasional actor. He was named Ray Charles Leonard, after his mother's favorite singer, Ray Charles. Leonard was the first boxer to earn more than $100 million in purses, and he is widely considered to be one of the best boxers of all time, winning world titles in five weight divisions and defeating future fellow International Boxing Hall of Fame inductees Wilfred Benetez, Thomas Hearns, Roberto Duran and Marvin Hagler. Leonard was named "Boxer of the Decade" for the 1980s.